As a life-long fan of Star Wars, I tried to play along, but I can't tow the party line anymore. The Phantom Menace could have been SO much better. Looking back at the Star Wars franchise, I now realize that I only really love the first and second movies (by which I mean chapters 4 and 5... if you don't understand what I mean, stop bothering to read any further). Return of the Jedi, while not bad, didn't live up to my expectations any more than Episode 1. I want to say that it was just the Ewoks (certainly, they were nothing to hoot about), but there was plenty more. But whatever, let's look at the Jar Jar one for now. 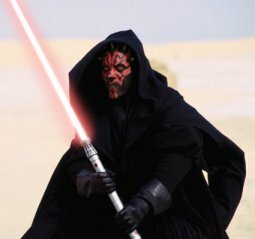 There have been a few underground edited versions of The Phantom Menace, but they are largely attempts by fans to improve the product from what was already shot. Some problems go back further than that, and could have been fixed in the script. With almost twenty years to work on it, we all agree George Lucas had plenty of time to come up with a better product. Anakin. The age gap between Anakin and Amidala was way too large. Lucas was trying to make the Queen seem very young (which is an interesting character choice), but Natalie Portman doesn't seem young (she seems just old enough. Follow me?). You can't help but look at Amidala and Anakin and say "they're going to have babies". With her character a good 8-10 years older, it just feels weird. She could still be older, but Anakin should have been at least a teenager. Some more years on him would give Anakin a deeper resentment of slavery, and more reason to want to get off Tatooine. It would also make his dialog sound better. A lot of the lines didn't really ring true coming from a ten year-old. The reason Lucas made Anakin so young was that he was thinking about the movie in terms of the younger audiences. "Wow", kids will think, "I'm the same age as Anakin Skywalker! This will give me much to think about!" But really, kids don't need a character their same age to connect with Star Wars. I wasn't even ten when I saw the first Star Wars, and it rocked my existence (ask my Mom and my third grade teacher Mrs. Dogario for all the sordid details). More on this in a moment. than it did after three? I can think of no good reason why Phantom Menace has to return to planet Tatooine. In Star Wars, Tatooine seemed remote and tucked away. We all know that eventually Obi-Wan is going to be hiding Luke on Tatooine, so come on! You think Darth Vader wouldn't consider checking there? If he meets Obi-Wan on Tatooine, then he knows old Ben has been there, and just how remote it is in the first place. Fooey, says I.
C-3PO. Along with Tatooine is the cockamamie idea of having Anakin be C-3PO's creator. Anakin, C-3PO and R2-D2, all chummy. Is Lucas high? Like everything in Highlander 2, these things just seem to detract (or outright contradict things) from the coolness of the previous films. I reckon at some point in Episode 3, the memory banks of R2-D2 and C-3PO will get erased to explain why they aren't freaking out in Episode 4, but what about Darth? He doesn't realize that his former droids are whooping it up with the other side now? With one of the biggest, most successful franchises in history, it isn't necessary to have these supporting characters to link the stories together. Vader is the only link we need. Midichlorians. Nothing takes away from mysticism faster than science. We were better off leaving The Force as a vague concept with nothing scientific to point to it. Nevermind the idea of the Midichlorians conceiving Anakin (another fruity idea), it just makes The Force less interesting. The plot elements involving Darth Sidious, the Trade Federation, Palpatine, and Qui-Gon were all fine. It was an interesting, new kind of story for Star Wars. Fan boys all knew that Palpatine was Sidious, but it was treated well, and new viewers didn't know right away (some still might not know). The semi-rebellious Qui-Gon made me think how easy it might be for Vader to destroy the Jedi (if they weren't all united, they would be easy pickings). Even Jar Jar isn't that bad on paper... it was his execution that left much to be desired (another obvious move with kids in mind). I don't hate The Phantom Menace, but I've been pretty disappointed. They say a movie like this can't possibly live up to the hype, but it can still be great. The Phantom Menace wasn't.